Another day. Another Tuesday. Another Random Tuesday Thoughts. Link up at Stacy Uncorked if ya like. We had another baptism in the family. My 16 yoa son, Logan, was dunked last Sunday. Jason did the talkin' and the dunkin'. I just stood there grinning from ear to ear. I knew if I started talking I'd start crying. And y'all know how embarrassing that is to a teenager. I'm a yard sale junkie but don't go to thrift stores much. No particular reason why. The other day, while running errands, I made a quick second decision and checked out one of the local thrift stores. I got quite the score! I purchased nine blouses, a pair of jeans, a Nike Jacket, and a Jos. A. Bank dress shirt. Nine pieces total, and all for just under $50. Those are the kind of prices I like to see. My husband is a goober. No doctor in the world can fix that. He's 38 years old and finally went to a doctor for the first time in years. He's never been established with a regular doctor and, after some pushing and prodding, finally went. The verdict is a severe case of varicose veins. Not the kind you see on women, the visible blue lines underneath the skin. It's the kind that looks like large, tangled knots all clustered together. He sees a vascular surgeon in March and very well may have to have surgery to fix the problem. He's never had surgery, so it will all be new to him. In fact, he's never had a complete lab work done before. That was also ordered. Just you watch, now that he's getting proper medical care, they'll find all sorts of wrong with him. Last year around this time, I plunged in freezing waters as part of the Polar Plunge. It's a fundraiser event to raise money for Special Olympics. Other plans kept me from doing it this year but my oldest daughter braved the frigid waters and went in deep. 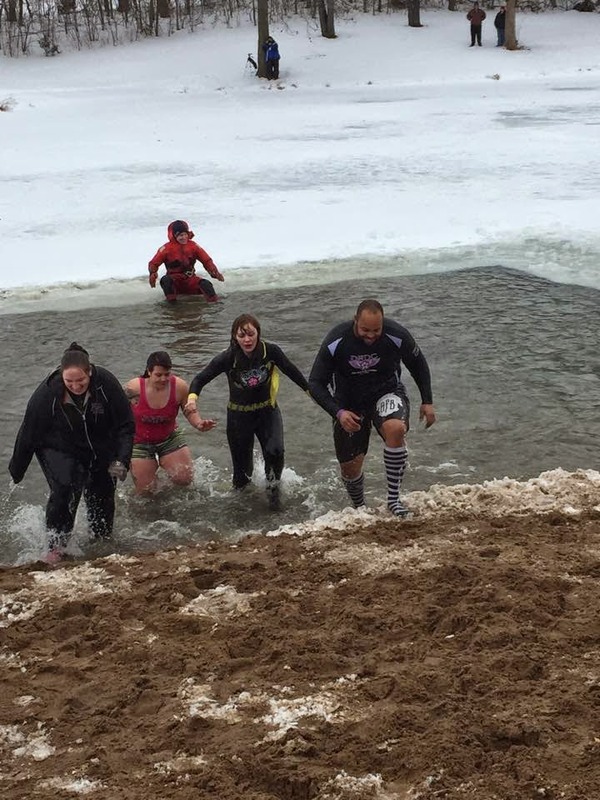 Firefighters had to cut through 10 inches of ice just to get to the water, and a total of 231 jumpers went in for a good cause. Shelby's not the crazy one in the tank top. She's the other crazy one, in the Batman pajamas. Do you shop at thrift stores? 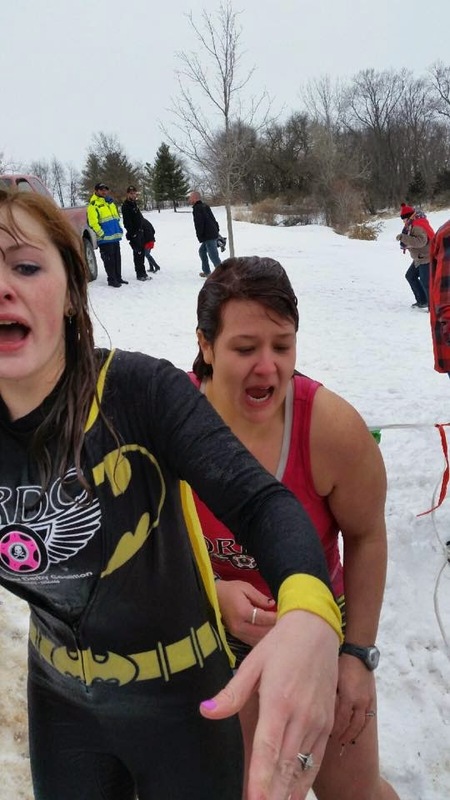 Know anyone who's participated in a Polar Plunge? What's your randomness for the week? Nope Im not brave enough to do the polar plunge. Kudos to your daughter! Plus I cant swim so Im not jumping in any kind of water. Congrats to your son on his baptism. Praise the Lord another soul saved! Just hearing that young people(all people) pulls on my heart strings and makes me so proud of him(them). Im enjoying the sunny weather were having. Its in the 70s. Im a winter person so Im always praying for rain/snow. Although I do love me a good yard sale, too! I used to shop at thrift stores all of the time but I haven't been lately. Boy I don't think I could do the Polar Plunge. It's just too cold for me. I don't know of anyone that has done it. Congratulations on your sons baptism. First of all, congratulations to your son and to you. Baptism is a wonderful decision! Did I tell you that I love, love, love thrift stores?